The skyline of Rotterdam would not be complete without the bright yellow Splash bus. Riding or sailing on the river Meuse: Splashtours belongs to Rotterdam. The sailing bus has become a familiar image for the inhabitants of Rotterdam. The many tourists and day-trippers still can’t believe their eyes when they observe the amphibious bus. The reservation for the splashtour will be made by City Sightseeing. Per email you will receive a second e-ticket with your reservation for the Splashtour. Splashtours offers a city tour through Rotterdam. A tour in this amphibious bus will be an unforgettable experience for both young and old. 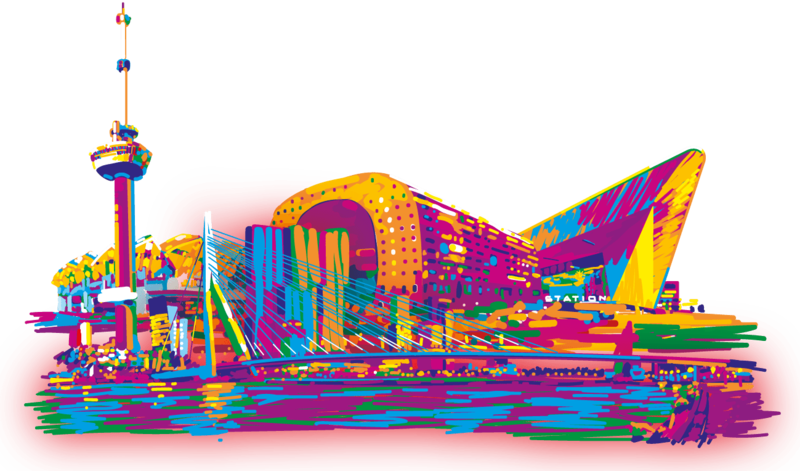 During this city tour, you will pass the most remarkable and special places of Rotterdam. Then….the splash: a spectacular dive into the Meuse. The bus turns out to be a seaworthy boat, which will sail along the spectacular skyline of the city. Splashtours departs from Parkhaven 9, opposite the Euromast (Navigational address: Parkhaven 20). Across ‘De Zwarte Zwaan’ guest can get in and out of the bus. At bus stop 3 you’ll Hop-Off directly at our door.